Photo caption: Pitiphatr Buri (second left), Managing Director of BHIRAJ Management Co., Ltd. under BHIRAJ BURI GROUP is seen with Noelle Coak, (second right), Thailand Country Head of Regus during the contract signing ceremony to open the 17th Regus business centre in Bangkok offering serviced office and co-working space at BHIRAJ TOWER at BITEC, a distinguished Grade A office building located in the prime area of Sukhumvit-Bang Na Road. The signing ceremony is witnessed by Nithipat Tongpun (left), Executive Director and Head of Advisory & Transaction Services, Office, CBRE and Roongrat Veeraparkkaroon (right), Director of Advisory & Transaction Services, Office of CBRE Thailand. 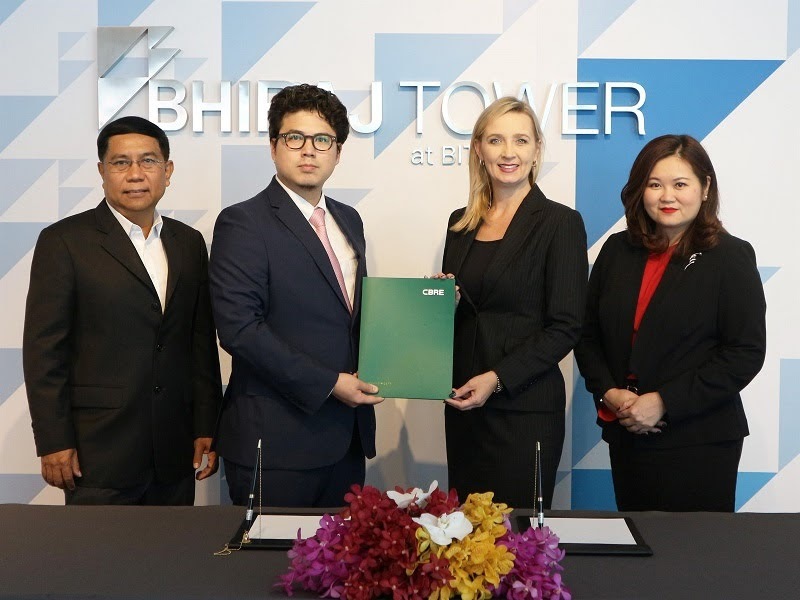 BHIRAJ TOWER at BITEC recently welcomed Regus Thailand, the world leader of workplace solution, as the latest tenant to take residence at the grade A office building in the bustling Sukhumvit-Bang Na area. BHIRAJ TOWER at BITEC is a new grade A office tower that features 29 floors and has a total of 32,000 square meters of office space. The building has a direct link to Bang Na BTS station and Bangkok International Trade & Exhibition Centre (BITEC) to offer ease and convenience, and provides companies and employees with a brand new style of working environment in a mixed-use concept for working professionals.